Sponsored by Lutron Electronics Co., Inc. Define the concept of daylight autonomy and several metrics that can be used to identify where glare conditions may exist and where useful, soft daylight fills the space. Identify the many design decisions that affect the amount and type of daylight that is available to a project and how deeply that daylight travels into a building. Compare the performance of manual shades and automated shades in terms of their ability to maximize the amount of usable daylight allowed into the space, provide glare control, preserve views, and achieve daylight autonomy objectives. Explain the results of daylight simulations conducted by LMN Architects proving that automated shades would create a large useful daylight zone while controlling glare, which created the comfortable, daylight-filled office space it wanted to design. Throughout history, daylight has been considered in the design of the built environment. Before electric light was invented, in the late 19th century, daylight was the primary light source available to illuminate the interior of buildings, schools, and residences. The houses of Ancient Rome were commonly found to have been planned around a courtyard, with surrounding rooms positioned so that the available daylight could penetrate deeper into the space. A guiding principle of Michelangelo’s iconic Laurentian Library, built around 1550, was to maximize the presence of daylight from both the northern and southern exposures in the reading room. In the mid-1800s, the one-room schoolhouses found throughout the United States relied on large windows to provide the teacher and students with enough light for their lessons. Today, while buildings could meet their illumination needs entirely with electric light, the inclusion of daylight in the interior is credited with several important benefits. Daylight exposure has been linked to improvements in employee productivity and student performance, and even the regulation of a person’s circadian rhythm, the internal clock of the body which drives the sleep/wake cycle and has a powerful impact on general well-being. Beyond the touted health benefits, using daylight instead of electric light to illuminate interiors could save an enormous amount of energy, making it a good-for-the-body and good-for-the-planet lighting solution. The key challenge lies in the fact that daylight is a dynamic light source. It comes in many forms, and its presence changes almost hourly. Daylight is affected by the time of the year and the weather conditions of the day. Fortunately, the advancements in daylighting technology and design know-how made in the past decade now make it possible to use the presence of daylight as an illumination source. Some designers are even seeking to use daylight as the exclusive light source for much of the day. This design objective, referred to as daylight autonomy, requires the careful reconsideration of many of the early design decisions made on a project and the selection of the right daylight management system to create a comfortable interior space, largely lit by the sun. 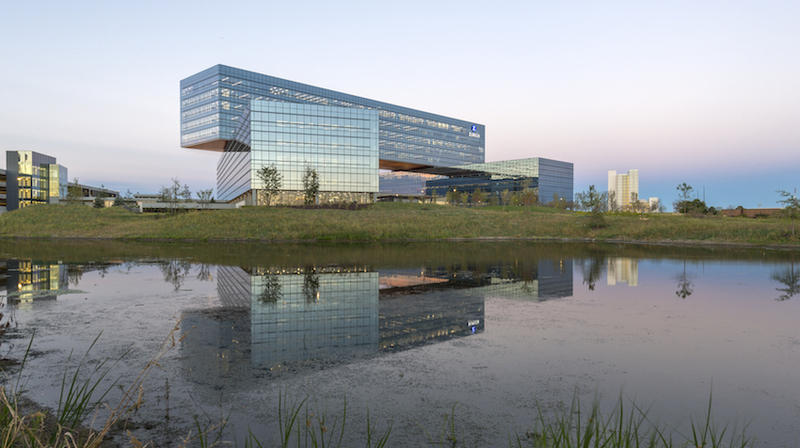 The expansive glass facade of the Zurich Headquarters in Schaumburg, Illinois, is outfitted with automated shades to protect the interior from glare, while maximizing the amount of usable daylight allowed into the building.